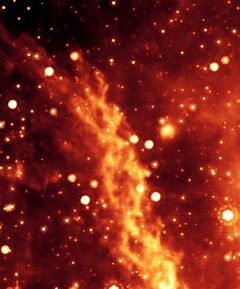 Amorphous masses called nebula whether near or far from magnetic pulls from black holes or dying stars don't become twisted as double helixes with cross bars just as the most common template for all life forms on this planet. Using this off-the-hand explanation is simply another attempt to explain something of which no scientist has the vaguest concept of origin. IMHO, the CBR (Cosmic Background Radiation) found by two Bell Lab Scientists in 1965 have much more to do with this phenomena than mysterious magnetic forces from black holes or black boxes with cats. Once an event horizon forms, Roger Penrose proved that a singularity will form somewhere inside it. Shortly afterwards, Stephen Hawking showed that many cosmological solutions describing the Big Bang have singularities without scalar fields or other exotic matter.